This year our Art Club took part in a Christmas Card Project led by Hertfordshire Independent Living Service. Schools across Hertfordshire were asked to create cards for elderly meals on wheels clients. The children designed an image for the front of a card which will be distributed in the surrounding areas. We hope they make someone smile this Christmas. 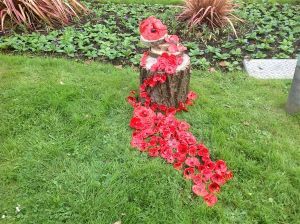 Children from Year 2, Art club and Mrs Lewis's class have made clay poppies to be displayed on the roundabout at The Old Pond as part of Broxbourne's Remembrance Day commemorations.